They say when you turn 100...You've seen it all...You've heard it all...You've done it all...You just can't remember it all..
We have seen Estonia overcome all odds in pursuit of freedom, a shared pursuit, whether you are of Estonian heritage or not. Vaatamata meie rahvusele ja keelte oskusele, oleme üksmeelselt tana koos, et puhitseda meie kodumaa 100a juubelit. So let’s go back to a day in our past… On Feb. 23, 1918, there were those that seized an opportunity after years of unrest and in the midst of a war. The majority of political parties had decided a month earlier, that Estonia would declare itself an independent republic. People were ready to take the risk, and suffer if need be, in pursuit of this goal. 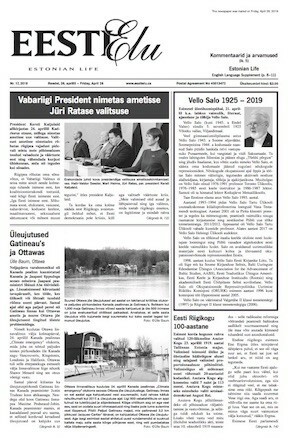 Two copies of the Manifesto had been prepared and printed on velvet paper in Tallinn, amid the unrest and chaos that was still very prevalent throughout Estonia. In Parnu, however, Estonian sentiments were stronger, and the city was under Estonian control. It was agreed then, that if independence could not be proclaimed anywhere else, the Manifesto would be brought to Pärnu and they would get it done there. And so it was, 100 years ago today, Jaan Soop, an official of the Autonomous Governorate of Estonia, hid one copy of the Manifesto into his coat lining and hid the other in the turned-back seam of his boot and boarded a train in Tallinn. It was a risky trip where the train was searched and all passengers were questioned, including him, but just after 4pm, he arrived safely in the beautiful port city of Pärnu. Thousands of copies of the text were quickly printed and distributed. The city was still dark after being bombed, but the word had spread and masses of excited Estonians lit torches and headed downtown. Students had also prepared blue, black and white ribbons which became the first public display of a unifying symbol for Estonians. At 8pm, from the balcony of Endla Theatre, surrounded by torch bearing young Estonian politicians, Hugo Kuusner (who later claimed that he just had the loudest voice), publicly read the Manifesto, for the first time, declaring the Independence of the Republic of the Estonia to the Peoples of Estonia. Its 8pm in Hamilton, a beautiful port city, just a little closer to Toronto, than Parnu is to Tallinn. Amid some unrest and confusion elsewhere, Estonian sentiment remains strong here and Hamilton Estonians said, if they can’t get it done anywhere else, Hamilton will…. and so it is that the first major Esto100 event in 2018, on this side of the world, is tonight, here in Hamilton. The first public display of the Estonian Flag at a Canadian City Hall commemorating our 100 years of Independence, already happened in Hamilton a week ago. Hundreds of excited, freedom loving Estonians and Canadians have gathered here in a chandelier lit hall, so beautifully decorated in blue, black and white. Meil on uksmeel, hea koostoo, sobralikus ja kullaltki jonni mis voimaldab meid edasi toodata, teades et meie eesti uhiskond ka siin, kestab. Tomorrow, is considered the official anniversary of Estonia’s Independence, and its already early morning, the 24th of February in Estonia! It was recorded back then, that even people, who otherwise did not get along, turned to one another and embraced with tears in their eyes — something monumental had just happened. Kallid kaasmaalased, oleme vabad ja enamus meist ei ole eestis sundinud, ega elanud. Aga me sudametes on pusinud polev armastus meie Isamaale ja tahtmine sailitada meie emakeelt ja kultuuri. Hoiame uksteist, arendame ja ehitame eestlust siin, tutvustades, meie ilusat ja ainulaadset kultuuri ka siinsele uhiskonnale. 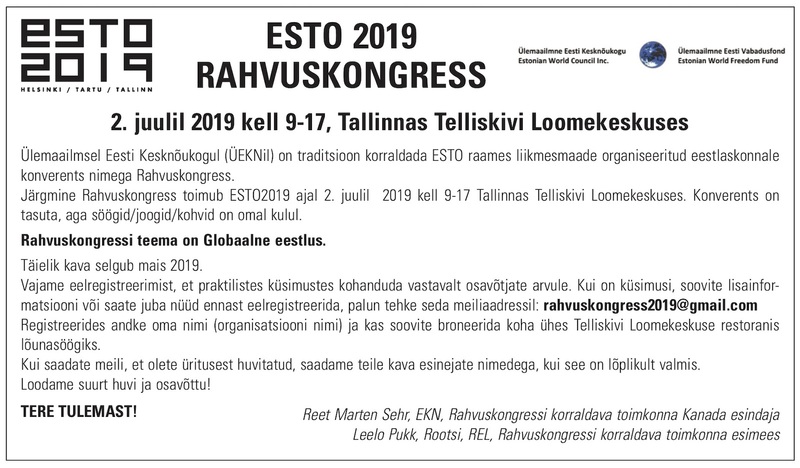 We all agree that Estonia is a country worth fighting for, but I strongly feel, that having a piece of Estonia here is also worth our effort, our time and our support. But like a free country, a good friend or health, we often don’t even appreciate what we have… unless it is gone. So, as Estonia steps into a new century, lets step forward together with renewed hope and optimism…forgiving past mistakes, and recognizing that vigilant, positive decisions make our community stronger and changes can be made while still honoring our past. Let’s all contribute according to our abilities and participate, remembering that only in giving, we are truly blessed. Eestlasted sammuvad koos tulevikku, vaatamata kus nad koik praegu elavad. Hoolitsegem viljapollu eest nii, et oleks alati leiba. Eesti muld on kaugel, eesti sudamed on siin. Neid ei sa lahutada. 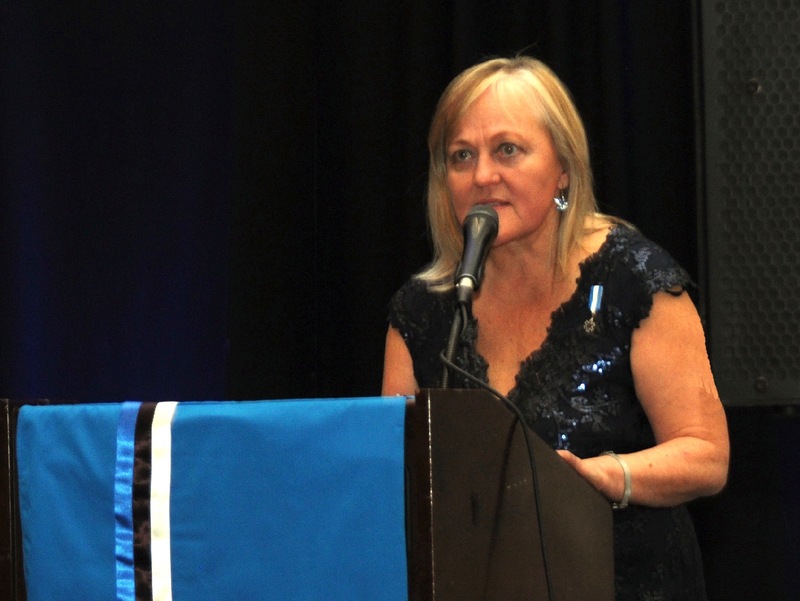 100 years ago, there was no formal banquet so now is our time to honor our past, celebrate our present so that we will always have an Estonian community here in the future. Our traditional celebration song is next, Ta Elagu… ja teine kord …Ta elagu…ja kolmas kord Ta elagu…ja tuhat AASTAT elagu… ja Tema onn see oitsegu! which I will quickly translate,….. it repeats.. Long may Estonia live, and again, long may it live and for the third time, may it live and for a thousand years may it live…and may its good fortune last and continue to flourish…. Please rise ,touskem koos tervituseks… EESTILE… We’ve needed both shovels and champagne to get us to where we are today. Well said, Lia. Although most of us were born outside of Estonia, we consider ourselves Estonians in our hearts. Thank you for expressing this love of our heritage so well. "Su üle Jumal valvaku, mu kallis Isamaa. ". Thank you to Canada for opening her arms to us, the former immigrants. Very beautiful speech! Impressive! Congrats!